Much like detectives study fingerprints to identify the culprit, scientists used NASA's Hubble and Spitzer space telescopes to find the "fingerprints" of water in the atmosphere of a hot, bloated, Saturn-mass exoplanet some 700 light-years away. And, they found a lot of water. In fact, the planet, known as WASP-39b, has three times as much water as Saturn does. found in this "hot Saturn." Because WASP-39b has so much more water than our famously ringed neighbor, it must have formed differently. The amount of water suggests that the planet actually developed far away from the star, where it was bombarded by a lot of icy material. WASP-39b likely had an interesting evolutionary history as it migrated in, taking an epic journey across its planetary system and perhaps obliterating planetary objects in its path. "We need to look outward so we can understand our own solar system," explained lead investigator Hannah Wakeford of the Space Telescope Science Institute in Baltimore, Maryland, and the University of Exeter in Devon, United Kingdom. "But exoplanets are showing us that planet formation is more complicated and more confusing than we thought it was. And that's fantastic!" Wakeford and her team were able to analyze the atmospheric components of this exoplanet, which is similar in mass to Saturn but profoundly different in many other ways. By dissecting starlight filtering through the planet's atmosphere into its component colors, the team found clear evidence for water. This water is detected as vapor in the atmosphere. Using Hubble and Spitzer, the team has captured the most complete spectrum of an exoplanet's atmosphere possible with present-day technology. "This spectrum is thus far the most beautiful example we have of what a clear exoplanet atmosphere looks like," said Wakeford. 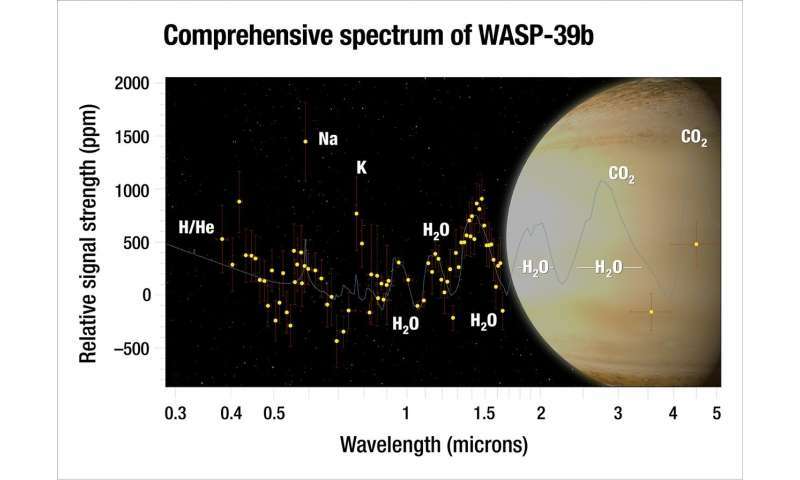 "WASP-39b shows exoplanets can have much different compositions than those of our solar system," said co-author David Sing of the University of Exeter in Devon, United Kingdom. "Hopefully this diversity we see in exoplanets will give us clues in figuring out all the different ways a planet can form and evolve." Located in the constellation Virgo, WASP-39b whips around a quiet, Sun-like star, called WASP-39, once every four days. The exoplanet is currently positioned more than 20 times closer to its star than Earth is to the Sun. It is tidally locked, meaning it always shows the same face to its star. Its day-side temperature is a scorching 1,430 degrees Fahrenheit (776.7 degrees Celsius). Powerful winds transport heat from the day-side around the planet, keeping the permanent night-side almost as hot. Although it is called a "hot Saturn," WASP-39b is not known to have rings. Instead, is has a puffy atmosphere that is free of high-altitude clouds, allowing Wakeford and her team to peer down into its depths. Looking ahead, Wakeford hopes to use the James Webb Space Telescope - scheduled to launch in 2019 - to get an even more complete spectrum of the exoplanet. Webb will be able to give information about the planet's atmospheric carbon, which absorbs light at longer, infrared wavelengths than Hubble can see. By understanding the amount of carbon and oxygen in the atmosphere, scientists can learn even more about where and how this planet formed. NASA's Jet Propulsion Laboratory, Pasadena, California, manages the Spitzer Space Telescope mission for NASA's Science Mission Directorate, Washington. Science operations are conducted at the Spitzer Science Center at Caltech in Pasadena. Spacecraft operations are based at Lockheed Martin Space Systems Company, Littleton, Colorado. Data are archived at the Infrared Science Archive housed at IPAC at Caltech. Caltech manages JPL for NASA. "Its day-side temperature is a scorching 1,430 degrees Fahrenheit"
But that's only in the US side, right? Why not use Kelvin and everybody will be happy? it underscores the fact that the more astronomers learn about the complexity of other worlds, the more there is to learn about their origins. Actually, nothing. They were not observed at the time. There is no stopping the naturalistic juggernaut : the base assumptioin is that planets "form" all by themselves from clouds of dust and that no outside powerful intelligent agent was involved. This naturally(!) leads to weird and wonderful fairy tales to explain the existence of the observed item(s). Exactly as was done here. Note that another assumption drives the "formed far away...migrated in" statement, namely that gaseous molecules would be driven off by the solar wind and hence the gaseous planet of necessity had to "form" far away. By understanding the amount of carbon and oxygen in the atmosphere, scientists can learn even more about where and how this planet formed. Sorry to pop the bubble but no, they CAN NOT! Unless and until someone somewhere actually observes just HOW a planet can form all by itself from a cloud of dust with no outside interference, there is nothing to be learned about how THIS particular planet (or any other observed/inferred ones) formed. It all comes down to fanciful storytelling filled with wild speculation at this stage. Each planet is going to have its own unique history and fascinating set of stories to tell. If we could imagine what we might find on the ~trillion planets in the Milky Way, perhaps it would strengthen our resolve to push beyond LEO again with crewed exploration. "There is no stopping the naturalistic juggernaut : the base assumptioin is that planets "form" all by themselves from clouds of dust and that no outside powerful intelligent agent was involved." Your posts match the outside agent parts. The powerful and intelligent parts, however, seem to remain a matter of opinion.